One criticism I personally would make is in regards to the layout and resulting flow of traffic. This was the first time the show was split into two floors, and it seemed overly difficult to navigate between them. Which was not helped by a lack of signage or direction between floors. The registration was on the first floor, but there was no signage directing people to where that was if they came across on the skywalk on the second level. In fact, coming from the skywalk dumped people right into the area by the programming rooms, and they had to have a security guard stand there to direct people down the escalator off to the side and around a corner. Once your ticket was secured, you had to exit that room and make a hard left to get the main ballroom... which was also unlabled as the entrance. Further adding to the confusion, people coming in from the street had to cross through the line of people coming, the line of people going up/down the escalator, and the line of people going into the main ballroom, as well as pass through the Wizard gift shop, before walking directly against the traffic of people who were coming from the registration area in order to get their own tickets. Once you were in one of the two main halls, getting around was pretty simple and straightforward -- in fact, the aisles were generally pretty open despite a lot of people trafficking through. I also heard of some early issues about retailers having issues getting in/out through certain entrances, although the same people said this was corrected by Friday afternoon. 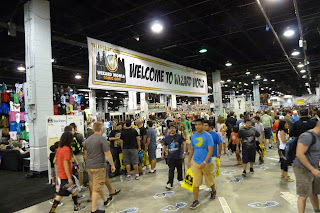 The biggest complaint I heard from retailers and exhibitors was that traffic/sales were not up to their expectations. Some of that came from people who had never done a Thursday show before, and were thinking it was going to be pretty close to a typical Friday. Some felt that their product was perhaps a little too far afield from the average Wizard World crowd. One retailer noted to me, though, that he felt the show was simply getting too large. That the number of retailers had grown substantially more than the number of attendees, so each retailer was getting a smaller portion of the overall money being spent at the show. I only heard one person expressly say they probably wouldn't do another Wizard show; he was also one who noted that his product probably didn't mesh with that audience particularly well. The programming rooms were tucked aside a bit. The initial ones weren't hard to find, but some of them seemed really remote relative to the show. Most of the rooms were in a central area, but some of the remaining ones were through another set of exit-looking doors and further down the hall and around another corner. There were some white board signs directing people to various room numbers, but they seemed too few and too temporary for as far apart as some of the rooms were. I couldn't help but notice, too, that the one panel on women in comics was the absolutely furtherst room away from the show. The rooms all seemed adequately sized -- although I didn't hit any of the really major panels that were generating the most interest. And the most noise. A few panels I attended were actually difficult to concentrate on because of the volume coming from the next room. The occasional bout of thunderous applause is to be expected, I suppose, but listening to what sounded like a concert was a bit much. It did get turned down eventually, I believe, thanks to some Wizard employees, but it still lasted quite a while. In general, it seemed to me like the new size/configuration wasn't logistically thought out as completely as it might've been. From what I could tell, it did seem like the convention folks were recognizing when/where there were problems and trying to correct for them, but there were some pretty significant issues that simply could not be addressed without some fundamental changes to the broader layout. It'll be interesting to see how they address some of these things next year.